Much of the literature on the book of Revelation paints a frightening apocalyptic vision of the end times. 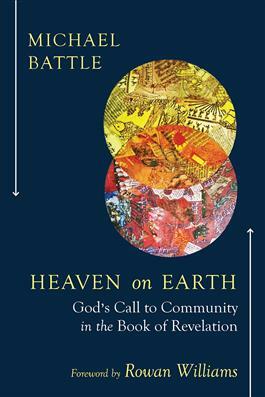 Michael Battle offers an alternative look at Revelation in this new work, seeing it instead as a hopeful call to bring heaven on earth. Battle explores the problematic imagery found in Revelation before showing how similar problems play out in our contemporary world. Battle sees Revelation as a guide that shows us that we can live out God's call for heaven on earth by living in community with one another, as exhibited through the writings of Martin Luther King Jr., Desmond Tutu, Rowan Williams, and Ubuntu theology. He writes, "I seek to imagine in my particular Christian context how a view of heaven need not lead to culture wars and further excuses for oppressing others. Heaven, as envisioned by John of Patmos, has much greater purpose." "The book of Revelation is a closed book to many perplexed by its content and a happy hunting ground for others for whom it provides apocalyptic ammunition in support of dubious politics. In the hands of Michael Battle it becomes a source of encouragement and challenge for building community in a world in global crisis. Michael writes with passion, insight, a wry humor, and clarity. He also writes out of his experience as a black Episcopal priest who has drunk deeply from the wisdom of Desmond Tutu, his chief mentor. No more needs to be said to encourage you to read and digest what he has written and to study it together with others on the journey of faith and building the beloved community." "Michael Battle is a fitting name to write a commentary on Revelation. The archangel Michael battles the forces of evil hell-bent on moving God's creation toward destruction. As I have reiterated, however, no such evil will ever prevail. Michael Battle is also a fitting person to write this book: not only did I ordain him a priest, I also watched him over the years grow as he continuously integrated theology with the practice of ministry. In such an integrated way, Michael invites the reader into the birthing process of heaven on earth. As with any birth, we must move through pain and struggle toward the life that God continues to create. Our politics, economics, spirituality, environmentalism, and much more move through such purgation to new life. And God will not abandon us. God, like a mother, holds us even now as we must move toward wisdom and maturity."